2" x .25" x 94"
Description - Lux Haus II collection by Engineered Floors offers a durable, commercially rated flooring product that is 100% waterproof. Complete with attached cork backing, this attractive wood look plank comes with multiple planks sizes within each box for a more realistic natural wood look, and offers the luxurious look and feel of hardwood floors. Lux Haus II planks are backed by a lifetime residential warranty and a 10 year commercial warranty. Size – Multiple sizes within 1 box: 5" x 36", 7" x 72", and 9" x 72". 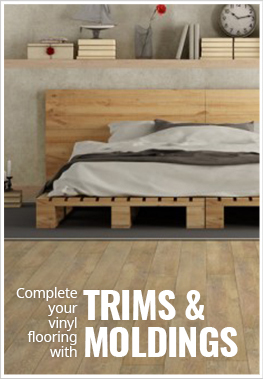 Recommended Uses – Lux Haus II rigic core planks can be installed on any level of the home, including rooms like basements, bathrooms, bedrooms, kitchens, and is even suitable for some commercial spaces such as boutiques, salons, studios, galleries, and more. My house now does feel like a castle - the Hearst Castle color option is a major swoon. The most important thing I would recommend is ordering the samples so you can see different color options and compare it to cabinets and counter tops before making the big decision. Thanks for the help. The floor has been installed 4 months now and still solid in place and looks good as new. We got these planks installed during the fall and got lots of compliments on our floor over the holidays! I'm so happy with the way they look and am glad we went with vinyl.